This is the “before” picture. I’ve increased my repertoire of canned foods every year, and with that increase in recipes came an increased yield. Then comes the question: where do I keep all these provisions? 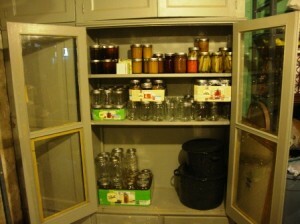 And after we finish each jar of pickles or jam or applesauce, where will I keep the reusable jars? Above you see the dilemma in June: a partial shelf of pickles and jams and applesauce and rhubarb waiting for their day on the table, surrounded by empty canning jars and freezer containers. Step 1: I cleaned out half the books at the top. Step 2: I gathered boxes for a thrift store donation (shelves out of sight on the left). 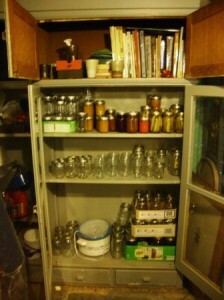 Step 3: I relocated the crockpot and reorganized the jars by size. Readers, this is the “after” shot – the “after” shot for June. 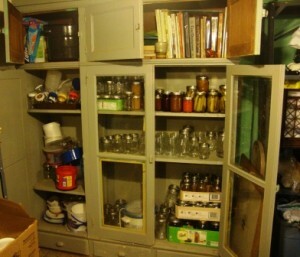 After I’ve canned my way through June and July and even part of August, this cupboard will look very different. I’ll be sure to show you then. Remind me. Really. And while we’re at it, readers, tell me about your summer reorganization projects. Canning supplies? Books? Thrift donations? Leave a comment. This entry was posted in family life, kitchen stories and tagged garden, it's not easy being green by Daisy. Bookmark the permalink. We’re about to begin a big project through the woods–making a proper trail for hikers/skiiers/ATVers!